The Divani Palace Acropolis is a five star deluxe hotel completely renovated during 2002, situated in a unique place in the shadow of Acropolis. A unique feature of this hotel is the ancient ruins of the Themistocles wall, discovered in its foundation and tastefully incorporated in the Hotel's architectural design. Within a few minutes you can go shopping or visit the intriguing Plaka and enjoy its fantastic nightlife. Constitution Square (Syntagma), Monastiraki and Thessio are within walking distance from the hotel or very easily accessible by various means of public transportation, including the metro (Acropolis station) or the hotel's free shuttle bus. 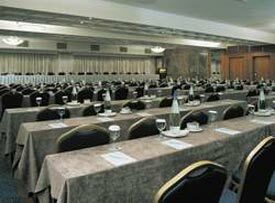 The hotel offers multifuctional meeting rooms that provide the ideal atmosphere for conferences, meetings and exhibitions. All rooms are soundproof, with individual temperature control systems and the latest audiovisual equipment. 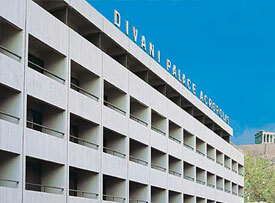 Access to Divani Palace Acropolis from Athens International Airport (Eleftherios Venizelos) is possible by bus, metro or taxi. By Metro: Take metro line 3 ("Airport" - "Monastiraki") and get off at "Syntagma" station. Then change to the line 2 ("Ag. Dimitrios" - "Ag. Antonios") and get off at "Acropolis" or "Syngrou-Fix" station. The hotel is within walking distance (5-10min) from both stations. The ticket costs 6,00 Euro. By Bus: Take bus line X95 to "Syntagma". The ticket costs 2,90 Euro. From Syntagma, take a taxi to the hotel. By Taxi: Costs approximately 25-30 Euro. Depending on the traffic, the journey from the airport to the hotel may take from 30 to 50 minutes.